Today I want to share a super quick and easy craft you can make as a wedding gift: wedding invitation ornaments! On our first Christmas after JM and I were married, we realized we didn’t have any ornaments for our tree! It was an easy problem to solve, but when we got wedding invites for a couple weddings this fall, I decided that I could do something to prevent that problem for those couples. One of the very first things I ever pinned after joining Pinterest (way before I even started this blog!) 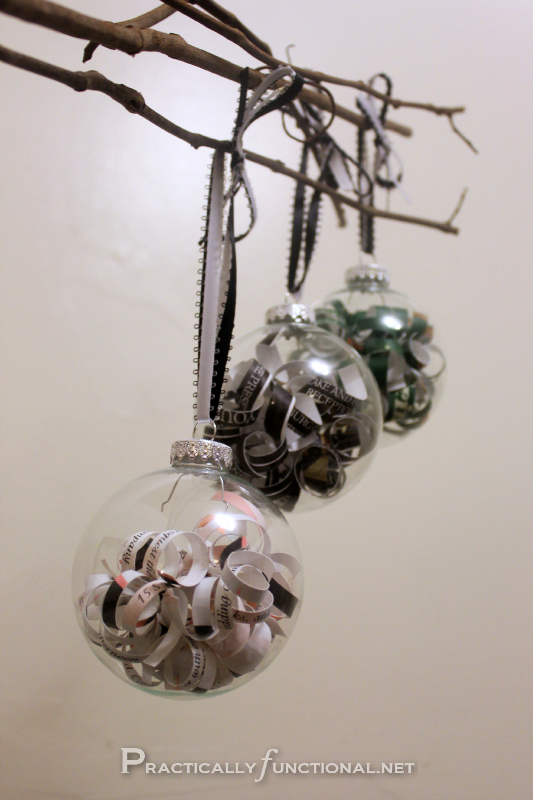 was a gorgeous picture of a glass ornament filled with paper curls, and it’s where I got the idea for these ornaments. I really love the invitations we had printed for our wedding, and I’m sure other couples (or at least the brides!) feel the same way. 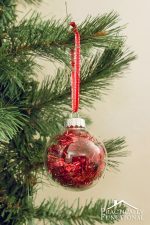 So these ornaments are the perfect way to make a keepsake out of those invitations while also providing a couple with an ornament for their first Christmas tree! And they’re ridiculously easy to make! 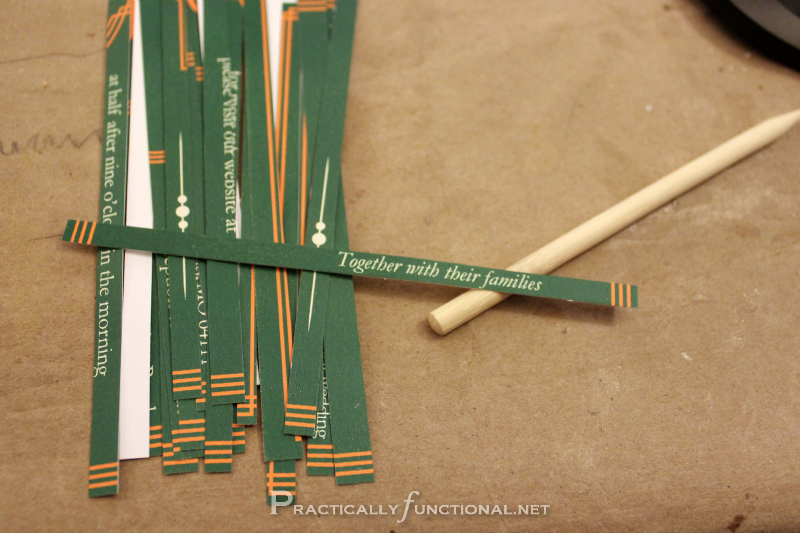 Start by cutting the invitation into thin strips. 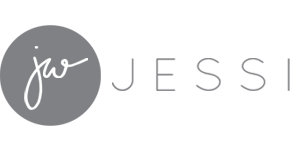 If you can, try to cut along the lines of text to preserve the important words. I love being able to find my first name and my husband’s name in the ornament I made for us! 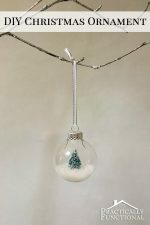 Depending on the size of your glass ornament, you might not have enough room for all of your strips, so choose your favorites and start with them! Grab a strip of paper and wrap it tightly around a pen, pencil, or similarly-shaped object (I had some caramel apple sticks left over from making caramel apples, so I used one of those). 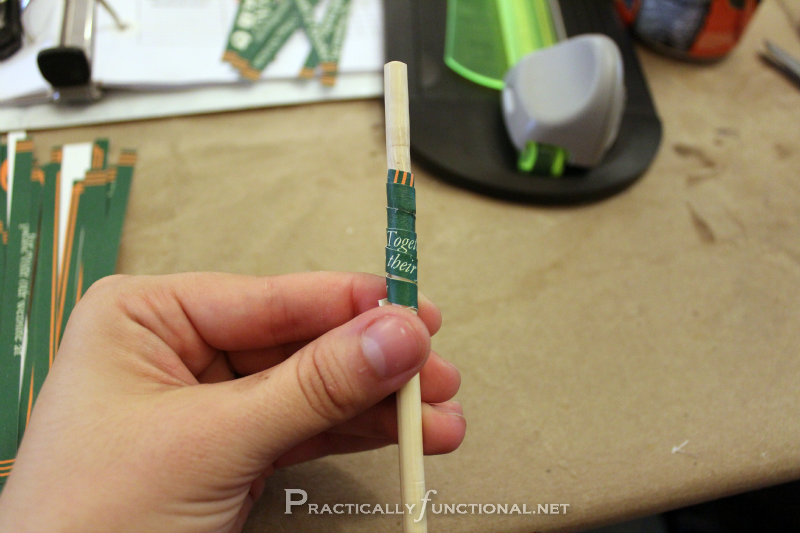 Once it’s wound tight, let go and the coil of paper will come off the stick. It will be pretty tightly coiled, but I found it works better if you “fluff” it out a bit and expand the coil. It will fill the space in the ornament better. 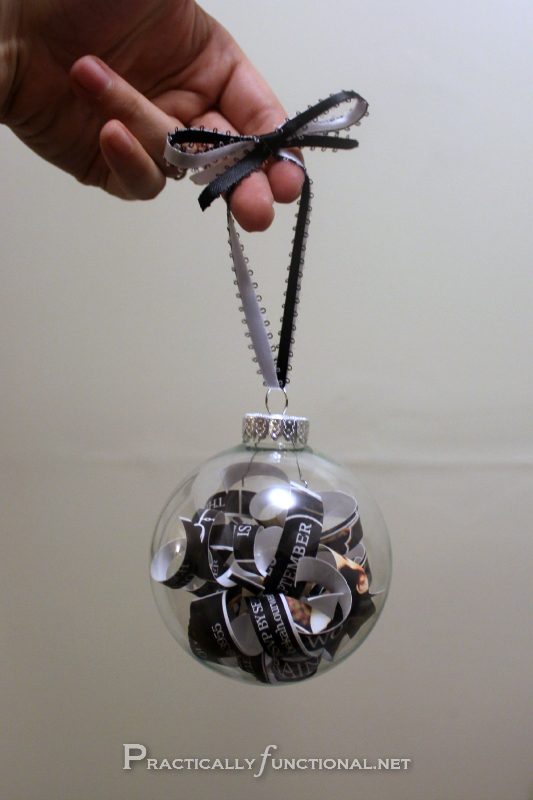 Open up the top of your ornament and stick the coil inside. Then start making your next coil. Continue until the ball is full! As I made this, I set aside the “important” strips (the ones with the couples’ names, the date, the location, etc.) and put them into the ornament near the end. That way I could try to position them so that they were visible from the outside, rather than hidden in the middle. Once the ball is full, put the top back on, thread some ribbon through the hole at the top, and tie a knot. And you’re done! Now you have a fun personalized wedding invitation ornament! They make a great wedding gift (just make sure you get the important details off of the invite before you go cutting it up!) Or just find some fun colored or patterned scrapbook paper and use that instead; that way you can customize it for any occasion! The pink and black ornament is made from our wedding invitation, the black one is from JM’s younger brother’s, and the green and orange one is from our college roommates’. For all you married people, do you still have any of your extra invitations? 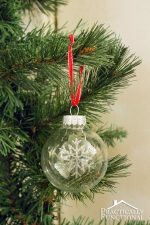 What other DIY Christmas ornament ideas have you seen recently? 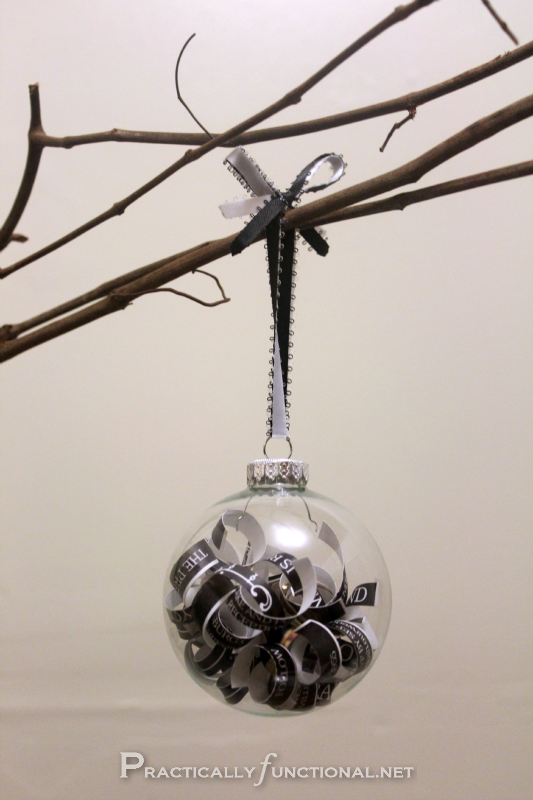 It is almost that time, I need to get on making a few others for our tree this year! 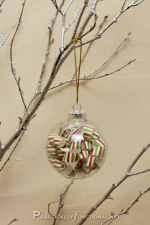 Want even more Christmas ornament tutorials?! 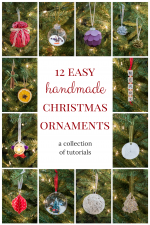 If you love Christmas and crafting, then my book 12 Easy Handmade Christmas Ornaments is the book for you! 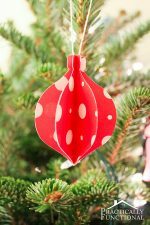 It’s a collection of 12 easy-to-follow tutorials for handmade Christmas ornaments that are the perfect addition to any Christmas tree! No experience necessary; just follow the simple step-by-step directions, and check out the photos along with each step if you need additional guidance! Grab a copy today and get ready to craft this holiday season! I link up at these awesome parties! More posts you might like! 12 Easy Handmade Christmas Ornaments Is Now Available! « Improve Your Photos With Lightscoop! Crafts, Cricut, & cleaning tips in your inbox! My husband and I saved our invites and 8 1/2 years later they are still hidden away in a box in the closet. I love this idea! I give my husband a homemade ornament each year and I think this may be the one I need to make him this year. Thank you so much for sharing this idea! Please come by and post on our Blog Party, In The Kitchen Thursdays! Hope to see you there! These are great gifts. I just made oone for my friend who got married last month. What a good idea! I still have a bunch of leftover invitations I think. I may have to try this. Neither of us had any Christmas stuff our first year! It’s funny, cuz both our parents have TONS of stuff, but I guess when we packed up the van to move out here we just didn’t think to grab any of it. But of course, after that first Christmas when I mentioned to Mom that we had no ornaments, she sent boxes full of “extra” stuff they had at their house, so we’re set now! What a unique idea! I love it, thanks for sharing. such a sweet idea! I would be honored if you shared this at my Ginger Jamboree Link Party! Very neat idea! I’ve never seen this done before. Love it! What a great idea! Also gets rid of all the extra invitations and programs I have laying around too! Thanks so much for linking up to the Keep Calm and Link Up! Hope to see you back next week! I made this last year from our wedding invitation. I never thoughts of it as a gift though – great idea. Thanks for linking up at Romance on a dime! 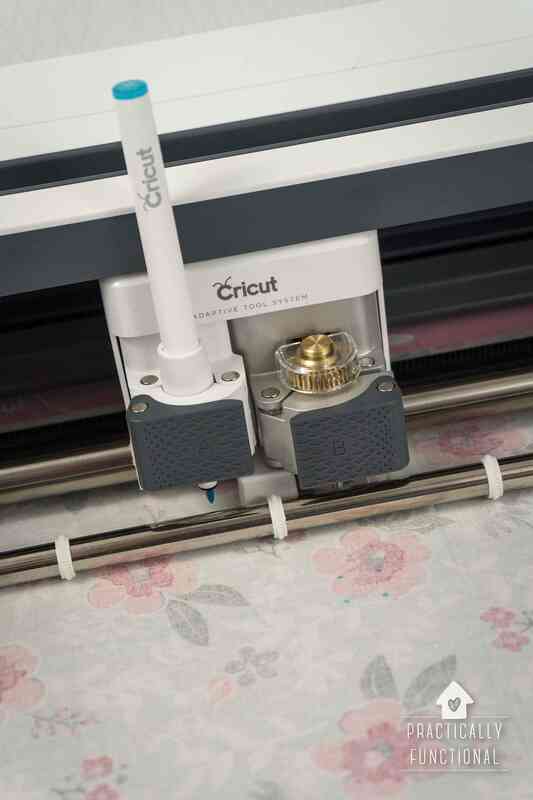 Ultimate Getting Started Guide For Cricut Beginners! This FREE 5-day email course has all the info you need to get started making awesome things with your Cricut right away!